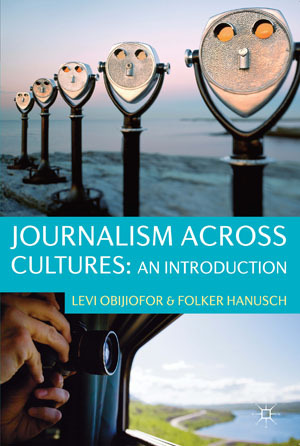 My new book Journalism Across Cultures: An Introduction – co-authored with Levi Obijiofor from the University of Queensland – has just been published by Palgrave. We have tried to provide a truly integrated overview on a variety of topics with evidence from across the globe, consciouly aiming to avoid a West-centric approach. See the cover blurb below, with a kind endorsement by Michael Meadows. Journalism Across Cultures examines the key issues that form the foundation of journalism practices around the world. It is unique in that it adopts a truly global approach to analysing journalism by paying attention to a multitude of cultural contexts in which journalism operates. By integrating major theoretical and practical approaches from across the globe, this insightful text analyses both contemporary and past media models and press theories to explore their philosophical foundations, origins and roles in various societies. In this comprehensive account, Obijiofor and Hanusch explore how transformations in global journalism – driven by new communication technologies – have dramatically influenced journalistic practices, and they examine the various frameworks that inform models of journalism education and training across the world. In addition, this expansive study investigates the role of gender in journalism, foreign news reporting, the debate over the role of journalists in covering peace and conflict, as well as the growing commercialization of journalism.